The unfortunately-timed computer death last week meant that I missed posting on a couple of subject I had planned to. On the upside, the same computer death has also kept me preoccupied such that I don’t have anything new from the last couple of days to blog about. So I’m able to go back and revisit these topics. The first one was this lovely little Red-breasted Nuthatch. Strangely enough, even though we’ve heard them in the surrounding forests since we moved in, I’d only seen a handful, and we hadn’t ever had one (that we’d observed, anyway) on our property itself. A week and a half ago we finally had one turn up. It visited the platform feeder once or twice, but mostly stuck to foraging on the trees in the vicinity. It then disappeared for a few days, and I’d figured it’d carried on since it hadn’t shown interest in the feeder, but then last Tuesday it showed up again. The species’ scientific name, Sitta canadensis, refers to the fact that the majority of its range is within Canada, though it’s also found throughout New England and the western mountain ranges where coniferous and mixed forest predominate. 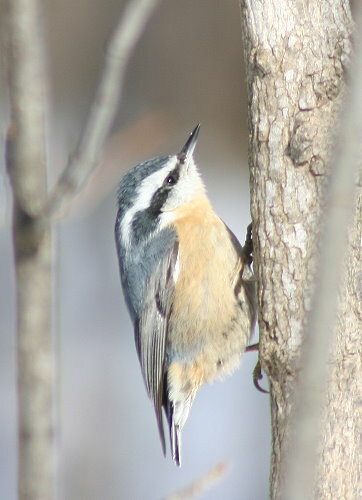 It’s the only species of nuthatch with such a strongly Canadian range; in fact, the White-breasted, which prefers deciduous forests, only creeps in along the southern edges of the country, Pygmy just barely makes it in to the Okanagan in BC, and Brown-headed doesn’t come anywhere close. 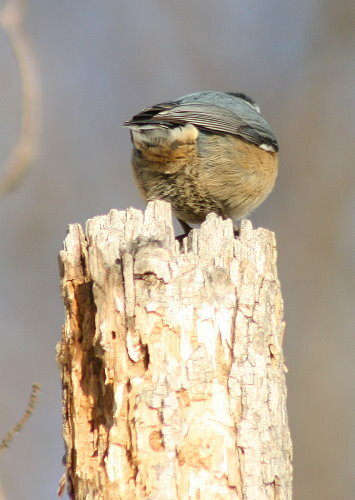 The blue-grey crown that contrasts with the dark greyish eye-stripe identifies it as a female. Nuthatches can be hard to age compared to other birds, but based on how brown the wings look compared to the back in this and the first photo, I’d hazard that this was a youngster, hatched last summer. 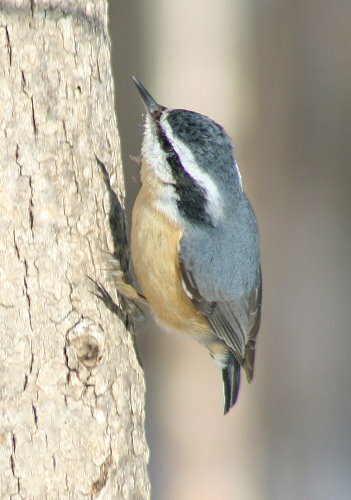 Very little data exists on how Red-breasted Nuthatches disperse from their natal territories, or how far they go. The species, particularly in the northern part of its range, is mildly migratory, and in lean years can undergo population irruptions southward. A very old description of the species (from 1918) suggests that their annual movements constitute a “centrifugal migration” – that is, many birds leave their breeding grounds and become dispersed through their wintering grounds, settling down there and not returning the following spring. However, there isn’t really any data that confirms or refutes this pattern, or quantifies what percentage may remain versus return. She spent most of her time going up and down the trees, peering into the loose bark and crevices, looking for food items. I tend to think of nuthatches as seed-eaters, but actually seed comprises very little of their diet, perhaps less than a third. Although no quantitative analysis has been done for eastern populations, a study in Oregon showed that even during the winter, anywhere from 56% to 77% of their diet consisted of beetles, depending on their habitat type. Although it seems likely that those numbers would be considerably smaller here, where we go into a deep freeze in the non-breeding months, it is still interesting to note what a strong component of their diets insects make up. 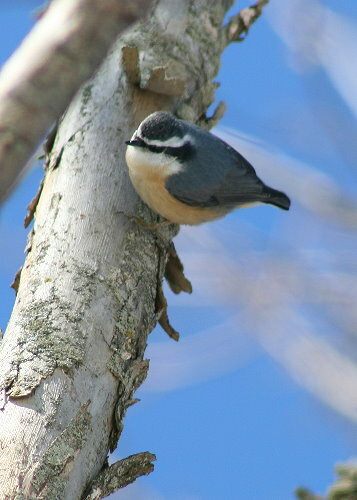 Nuthatches are food cachers, tucking food away in safe places for future retrieval. They mostly store seeds, although they will occasionally store insects and spiders. They use not only natural crevices and gaps in bark, but also old sapsucker holes, and sometimes even the ground in regions where the ground isn’t frozen. They’ll often cover up their cache site with a bit of bark or lichen if a handy piece happens to be within easy reach (a 1995 study reported 44% of caches), which is presumably to conceal their carefully hoarded food items from other birds. 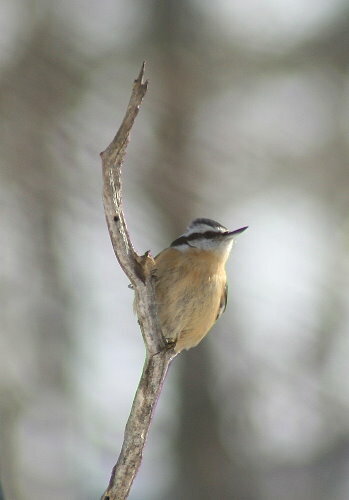 Hairy Woodpeckers have been observed to watch nuthatches as they cache their food, and then go in to retrieve the food item once the nuthatch has left. Crafty! The American Ornithologists’ Union, the Cornell Lab of Ornithology, and the Academy of Natural Sciences undertook a huge project back in the 1990s and early 2000s to compile all of the known information about every North American bird species (including Hawaii) into a series of informative accounts. The Birds of North America is now THE destination for information on a species, providing invaluable information and data (such as the diet figures, above). A full set of the 716 printed accounts will cost you a pretty penny (although you can now buy accounts individually from Buteo Books), and the online version requires an annual subscription (much more affordable, though). They have six sample accounts available on the website for free, such as for the Yellow Warber, that give you an idea of what they all contain. You can also probably access all of the accounts for free at your nearest university library. A number of years ago, my mom co-authored a couple of accounts with a friend of hers, and as an author was offered a complete set of the printed accounts for free. Of course she took them. However, with the move to their new house, and because she rarely references them herself and felt I would get more use out of them, she’s offered them to me. I gleefully accepted before she could change her mind. These accounts are a wealth of information, both the sort you would expect to find, as well as the obscure. Where else are you likely to discover that Red-breasted Nuthatches sing 2-6 notes per courtship “song” with 12-16 songs sung per minute, or that their thyroid averages 0.0163% of their body weight? Or that in 1969 one observer watched a nuthatch foraging on the back of a deer like an oxpecker? That Red-breasteds can reach a maximum speed of 32 km/h, or that before the kids are born the male and female will roost together in their cavity at night? It’s hard to pick through the 20+ pages of an account and select just a few tidbits to share. This seems to be the shot I get most often when photographing birds. Why is that? I haven’t seen her again since last week, though Dan may have. It’s possible she’s moved on for real this time, headed further down the lake looking for additional food. I wonder if she cached any food around here. If she did, she may be back. What wonderful shots you got of her. She’s a real beaut. Here in Central Maine we are lucky to have a few. I thoroughly enjoyed reading the particulars. You are an excellent teacher, and so lucky to have been gifted with those volumes. Moms are great to have around. At first, I was amazed on how much you know about these Red-breasted Nuthatch. Then you spilled your own secret. Ha. The volumes in total cost over $5000! I’d stick to learning from you then. Thanks for sharing the knowledge. Very informative posting on the red breasted nuthatch. I am blessed with a fair multitude of both red and white breasted nuthatches at my feeding station. They are such dependable birds, along with the chickadees, at our sunflower feeders and they do partake of the suet as well. Very interesting links to share. Thanks! We have the white-breasted, and their personality makes them one of my favorites. I love reading about my favorite bird the Red-breasted Nuthatch. We have four of them hanging around this winter. BTW, I love your art! Thank you, everyone! It seems she’s sticking around, at least for the time being, so we’ll get to enjoy her for a while yet.